I have been container gardening since April of this year and I must say it has truly been an experience. Just the mere fact that I am able to grow something from seed to fruit is amazing. Don't get me wrong this journey been a great one but also a rocky one. From me believing that my sweet banana pepper plant had died before it even started to grow fruit to my peppers looking very short in stature to the seeds I had planted not sprout at all. This list is really endless because gardening is always trial and error to see what works best for you and your conditions. My salad mix that I am currently growing has been good to me though because of how easy it is to grow and grow. How to harvest salad greens. One of the easiest things to grow and harvest is salad greens, just plant your seeds and water. Depending on the type of seeds you have decided to grow it can take up to 21 days until your leaves are ready for harvest. All you need are a pair of scissors and salad greens that are ready to be harvested. To harvest the salad greens, just cut the greens leaving about 2" inches so that you can harvest some more salad mix in a couple of weeks. Cut and grow. Simple. I am proud to say that finally one of my heirloom tomatoes is finally starting to turn red from my Cherokee Purple Plant. I currently only have 2 tomatoes growing on the plants. My tomato plants began to flower and set fruit, but only 2 tomatoes started growing. The other ones still remain to be very small tomatoes and I mean...... TINY. No other flowering has really occurred since my plants initial flowering began. I have since then add additional fertilizer to the them with the first time being 30 days after I planted them. I am using Dr. Earth's Tomato, Vegetable, and Herb Fertilizer. I think right now that all of my plants energy is going into growing those tomatoes which is not allowing any the energy to spread to the other fruits. Also this weather has been on 10 in Atlanta since spring, with temperatures reaching up into the mid 90's which is drying up the soil . With container gardening it is very important to keep the soil moist, requiring the plants to be water up to 2 times a day. I have decided since I am away for long periods of time and the it does not seem to be an end to this HOTLANTA weather I need to mulch my plants. Mulching helps reduce water evaporation thus helping your plant retain moisture in it's soil. Once I harvest both of the tomatoes from the plant along with mulching, I hope that my other tomatoes will begin to grow. My 2 sweet pepper plants also have decided it is time to grow some peppers - which brings pure joe to my soul. 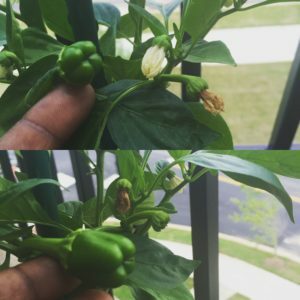 I harvested 2 tiny peppers from both plants long ago - my first fruits. Both of the plants at the time were actually pretty short not tall at all. It took about 4 weeks for the plants to begin to flower and set fruit. I am container gardening from my balcony which is 4 stories up so bees don't quite make it up to my plants as often, so I have to hand pollinate my pepper plants to get fruit to set. I either use my fingers to get in the flower or a shake my stakes to give some vibrations to the plants. Baby jalapenos - These were beginning to turn red before maturing to size. I think I have to many growing on the plant so the energy is not evenly distributed. What have you already harvested this season? Let me know below.